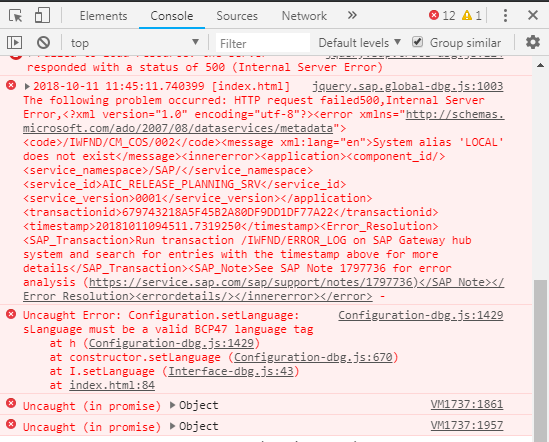 This blog post can be useful in case you encounter this specific issue or if you encounter another, similar issue in a web based application on SAP Solution Manager. In the second case it can give you an idea of the steps that you could follow to troubleshoot the situation. What immediately pops into my mind at that moment is “f***”. You might have expected something else but hey, that’s a normal first human reaction to this situation, right. The second thought is then “How can I fix this?”. What I often do first is a quick search on SAP Support Portal / Google describing what I see or what has happened. SAP Release Planning Solution Manager grayed out or not loading – something in those lines. Nothing useful comes out. I might have used the wrong keywords so I give it another shot changing the keywords around a bit but still, nothing. The next step is always, check the logs, check the traces, check the error messaging (if there is some other spot besides logs and traces) to check and try to figure out why on earth this is happening. No, it’s not global warming in this case. In this case, I try to call up a web based application so then it makes sense to look at what other useful information my browser might be able to provide me with. Most if not all recent browsers have so called developer tools available that can check for HTTP error logging or codes and have more detailed information about what is going on. So I open up the developer tool to have a look at error messaging. If it’s blank, you might need to refresh your page after you open up the tooling again. In the console tab I see above information, neat, sounds like it will be useful. So the system is telling me that service AIC_RELEASE_PLANNING which is known in the SAP Netweaver Gateway is trying to use system alias “LOCAL” and system alias “LOCAL” doesn’t exist. Kind of logical that this would throw an error then. Ok, so on to getting this fixed. The next step is to have a look at the configuration of the service then in the SAP Netweaver Gateway. The transaction to do this is /IWFND/MAINT_SERVICE. No worries if you wouldn’t know this (or you don’t know by heart). Just Google what you are after in terms of troubleshooting or fixing the situation. Searching for maintain netweaver gateway service transaction would make it easy for you to find this transaction. Now there is a kind of “weird situation” because when I looked at the lower right part of the screen, I saw LOCAL_SM as system alias. That alias is not mentioned in the error message so it looks correct. The idea now is to go back to the previous screen, remove the system alias and then use add system alias again to get the right system alias (the one that does exist) assigned to this service. Add the entry again but now with the correct SAP System Alias (you can use F4 input help to select it) and check the default system and metadata default checkbox also. Now we see again LOCAL_SM as SAP System Alias and you might think, well that was here before, right. But now you’ll also see LOCAL_SM if you click on Customizing. That is where the initial issue originated from LOCAL_SM in one screen, LOCAL in the customizing settings on the next screen. Now refresh CRM UI again. Et voila, there you have your release planning application.